With the World Series over, the MLB free agent season has begun. Over the next few months, some franchises will see their fortunes rise, while others will fall. Marquee names like Prince Fielder and Albert Pujols could find themselves wearing new uniforms for spring training. General managers will look for MLB free agent bargains while analysts and baseball purists bemoan how much often-injured middle relievers command. Here we'll keep you updated on major MLB free agent signings and discuss how it's likely to impact their hobby standing. Hobby Impact: Potential sleeper pickup. 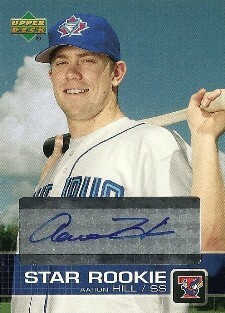 For years, Aaron Hill played solid baseball outside of the spotlight as a member of the Toronto Blue Jays. However, the last two years were rough on the second baseman. Finally, the Jays decided a change of scenery would be best for the former All-Star and sent him to Arizona in a late-season deal. The moved may have paid off for Hill and the Diamondbacks as he rebounded with a .315 batting average over the final 33 games of the season. Should Hill continue to regain his All-Star form and Arizona continue to contend, his 2003 rookie cards for see some gains, particularly his Bowman Chrome Refractors. Collectors might want to also consider Hill's 2003 Upper Deck Prospect Premieres autograph. Hobby Impact: Who collects closers? Papelbon is going from one big-market team to another. Both Boston and Philadelphia have some of the most dedicated collectors in the hobby. So while Red Sox fans may dump their cards, Phillies fans are just as likely to snag them. As a closer, Papelbon doesn't command high hobby prices to begin with. He has rookie cards in 2003 Bowman Draft and 2003 Bowman Chrome Draft (both were packaged together in the same release). Ungraded, neither command more than a couple of dollars. A better investment would be his numbered Bowman Chrome Draft XFractor (/130) and Gold Refractor (/50). Papelbon's certified autographs regularly sell for about $10. Hobby Impact: Little to none. After heading back to Cleveland to finish 2011, the Jim Thome farewell tour sends him back to Philadelphia where he played from 2003 to 2005. Joining the 600 Home Run Club last season cemented Thome's place in baseball history and this move shouldn't hurt or help his values. 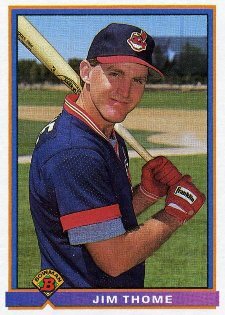 Thome's 1991 rookie cards can still be found for the price of a pack of gum, a victim of the massive overproduction from the early 1990s. A better bet for collectors are his certified autograph cards. While there are many options, he hasn't signed a ton of cards over the years.